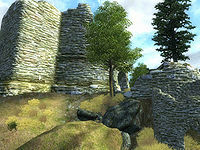 Crowhaven is a medium-sized fort northwest of Anvil containing vampires (quest-related). It contains two zones: Crowhaven and Crowhaven Burial Halls. Crowhaven cannot be fully explored without the key given to you when you start the related quest. This location's map marker (M on map) is named Crowhaven (editor name CrowHavenMapMarker). The entrance door is WNW of the marker, 130 feet away. 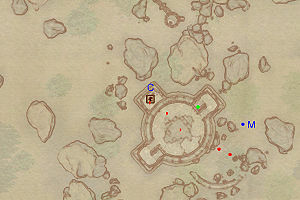 This zone is entirely linear and contains a limited amount of treasure and enemies. Upon entering, proceed forward and kill any leveled beasts you encounter and loot the coffin in the tomb-like structure. 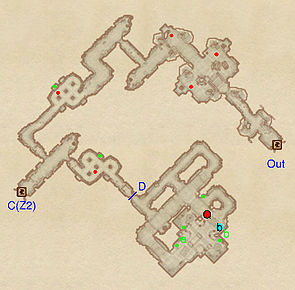 Follow the path until you reach an intersection; either go through door C, leading to the second zone, Crowhaven Burial Halls or, if you have started the related quest, use Agronak's Mysterious Key to unlock door D and gain entrance to the lair of Lord Lovidicus. Upon unlocking the door, either jump over the railing or follow the path and go downstairs. After going up another set of stairs, the environment changes, as furniture decorates the walls and the mine starts to resemble a real home. Lord Lovidicus is a hostile NPC and will attack you on sight, though he carries only a leveled dagger and wears no armor, so he is very easy to defeat. Skip the clutter chest atop a set of drawers, but unlock the jewelry box and claim the contents. Pick up the Journal of the Lord Lovidicus at b and loot the nearby chest. If the Lord (Q) has not yet detected you, now is the time to battle him. 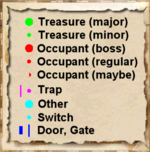 Loot his corpse for a leveled amount of gold and a piece of jewelry, and search through the furniture for useful items, then backtrack all the way back to the intersection and go through door C for a much smaller zone, Crowhaven Burial Halls. 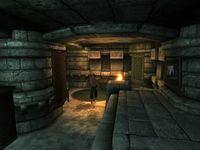 Crowhaven Burial Halls is a fairly large tomb area, inhabited by Vampire enemies, one in the main hallway and two near the many coffins. There is no real strategy for this zone, locate the four minor loot chests (green dots on map) and fight the Vampires for some good equipment and vampire dust. Finally, head back to Crowhaven through door C.